Crunch. Crunch. Munch. Munch. There was an interesting segment a while back on NPR (National Public Radio) about why humans crave crunchy foods. The theory dates back to millions of years ago when primates ate crunchy insects. If they were crunchy it meant they were fresh. In more recent years humans started to eat plant and vegetable foods that were also crunchy and again, crunchy meant fresh. Nowadays, crunchy stills means fresh unless, of course, it’s Cookie Crunch cereal or most of the highly processed snack foods available to us. But we’re wising up to that and becoming creative in our kitchens using whole food cooking to bring us a fresher version of a tasty crunch (without all of the hit list foods). 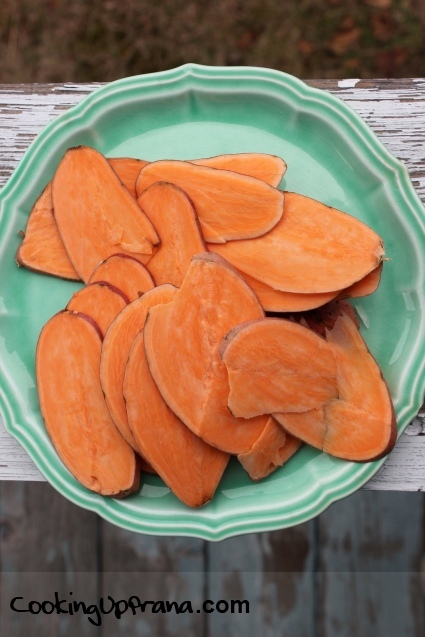 Sweet potatoes are a great source of crunch. Cut thinly they turn out to be the tastiest chip. Packed with crunch that won’t leave your primordial brain craving for the allusive crispiness. 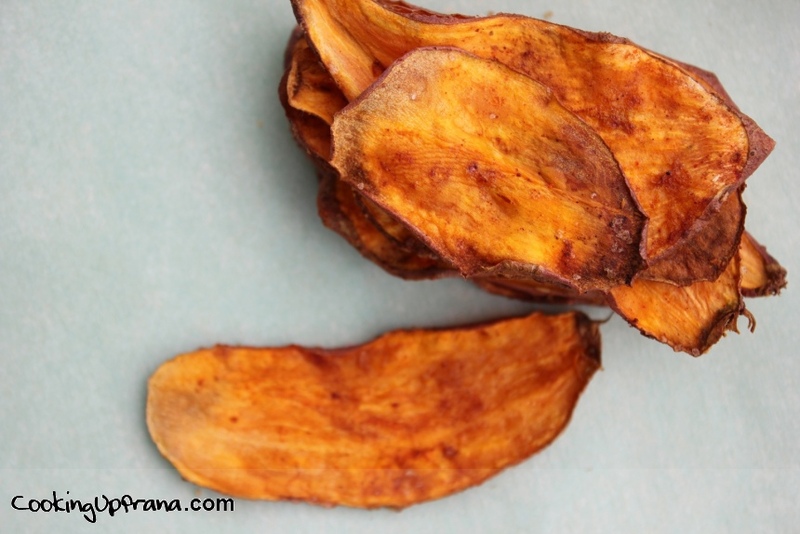 Ayurvedically-speaking these chips are great for everyone, except Kapha only in moderation. I’ve included some small variations at the bottom of the post so you can tweak it to best fit your constitution (what’s my constitution? find out here). To cut them extra thin (for extra crunchiness of course) I used a mandolin – not necessary but completely fun and worth it if you have one. 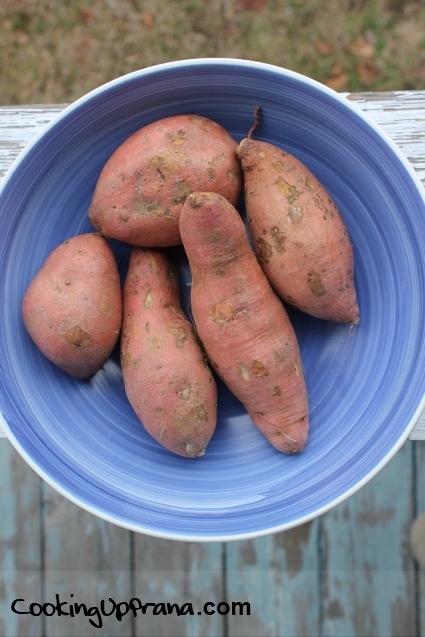 Sweet potatoes are a great source of vitamin A (in the form of beta-carotene) and a good source of manganese and vitamin C. They also act as a relatively good source for copper, dietary fiber, vitamin B5, and potassium. Combine all seasonings with olive oil in a large bowl. 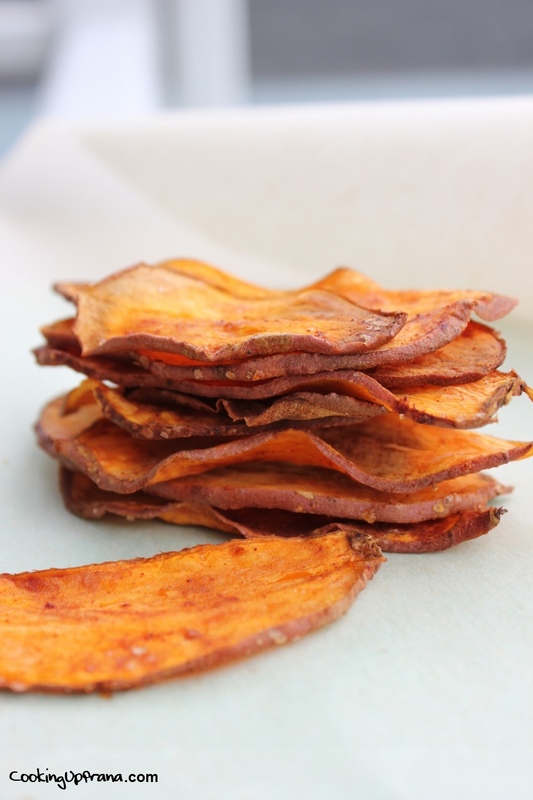 Line sweet potato slices in a single layer on ungreased baking sheet or use parchment paper. 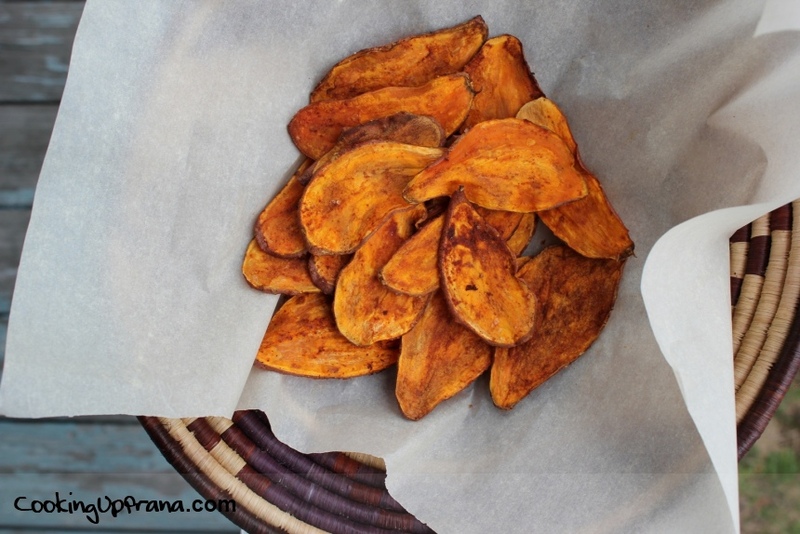 Use thinner slices of potato and cayenne pepper, eat in moderation. PREVIOUS POST: What is Ayurveda?